← Did you REALLY think Wade Boggs was going to pay for your kid’s future college education? April 20, 2010 · 2:09 pm.04. HEARTBREAKER HILL: Childhood crush Valerie Bertinelli runs the 2010 Boston Marathon to raise money for the Dana Farber Cancer Institute. Congratulations, Valerie! “Culture Schlock” means many things to many people. For some, it’s one-stop shopping for daring political commentary, a smidgen of heartwarming nostalgia, exclusive Middle East fashion news and endless plugs for silly pet projects. For me, it’s a safe, welcoming place to share my deepest, most personal secrets. Today’s confessional: I had a childhood crush on actress Valerie Bertinelli, who’s now back in the news for her self-esteem books and for just finishing the Boston Marathon. Out of fear of provoking jealousy, I didn’t dare mention this while she was married to Eddie Van Halen. But now there is no harm in engaging in some serious self-reflection. In the 1970s, why did I religiously watch the sit-com “One Day at a Time,” a tribute to wacky adventures of a single mother? I suspect it had nothing to do with feminist solidarity. I was mesmerized by younger daughter Barbara — the one without the drug problem. Valerie Bertinelli was one of many childhood celebrity crushes, joining Linda Carter ("Wonder Woman"), Christie Brinkley (bedroom wall poster), Loni Anderson ("WKRP in Cincinnati"), Barbara Feldon ("Get Smart"), and Dawn Wells ("Gilligan's Island"). Because of this letter, I never became the local chapter president of the Valerie Bertinelli Fan Club. However, in retrospect, I do admire the 1970s stationery and funky font choice. So, Val, you were too “busy” for me? 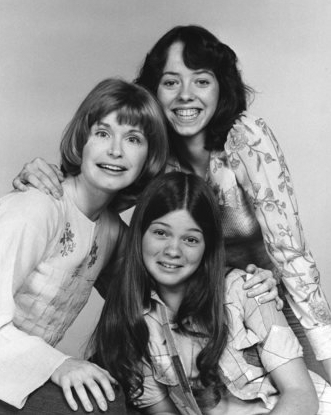 It seems like you had plenty of time to spend with Bonnie Franklin and Mackenzie Phillips. And plenty of time to gallivant around with that Schneider fellow and his tool belt. Was it really too “difficult” to sit at your typewriter (yup, that long ago) for a minute and bang out a few words of wisdom to an impressionable young boy? Only in 2010, after years of marriage and the births of two children, have I been able to fully process this emotional setback in context. Keeping this note is evidence that I’m a bonafide packrat, but maybe it has deeper implications. Perhaps it is time to let go. 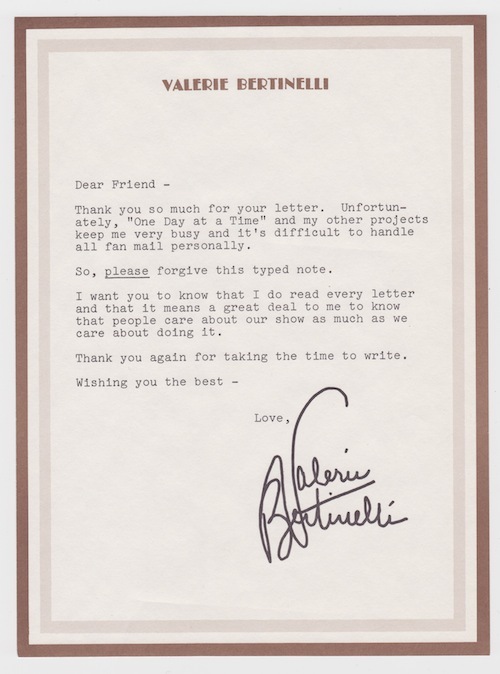 In your form letter, Valerie Bertinelli, you asked me to forgive you and I do. I know you never meant to diss me. I apologize for my meanspirited wisecrack four paragraphs ago about Schneider and hope we can get to know each other better on Facebook. Or maybe on Twitter — a medium that actually makes mailed form letters seem warm and personable! April 20, 2010 at 2:09 pm.04. I’d trade a lifetime with her for a 15-minute guitar lesson with Eddie ANY DAY. April 28, 2010 at 2:09 pm.04. Oh, yeah? Well, I’d rather spend 14 minutes listening to Valerie reminisce about her “One Day at a Time” years than spend a year on the road with Eddie Van Halen. I am still outraged how he unceremoniously kicked out the far more talented and charismatic David Lee Roth. You don’t treat people like that, Ilya. December 10, 2010 at 2:09 am.12. Valerie, I just wanted to let you know that I admire you so much. You are such a positive mentor. You have always kept your smile, faith and zest for life and I respect how you have “kept on”, when things have been tough. Thanks for being such a great person, mentor and actress! May 29, 2012 at 2:09 am.05. is there any way i can get a autographed photo of valerie. i have always admired her and to be truthful a crush on her also.